The setting: A gated community. The suspect: A retired police officer. The case: Electricity theft. Duke Energy investigators were at first skeptical. A well-off retired officer and a high-earning attorney – why would they steal? But they caught the former officer switching out his meter. Busted, he wrote a check on the spot for 18 months of stolen electricity. “To him it was the thrill of the chase,” said Jason Parker, Duke Energy supervisor of Revenue Assurance in North Carolina. Revenue Assurance is the Duke Energy division responsible for stopping energy theft. In 2018, the team recouped $11 million in the Carolinas and Florida; plans are underway to expand to the Midwest. Stealing electricity or natural gas is dangerous, illegal and drives up energy costs for other customers. 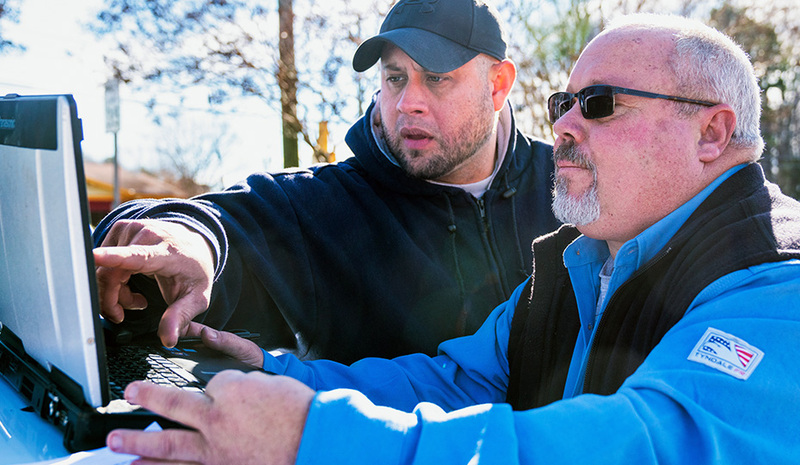 Jose Roman, left, and Stephen Philemon of Duke Energy's Revenue Assurance team working in the field. Made up of employees with varying backgrounds – meter technicians, lineworkers, billing administrators – the team roams swaths of territory in company SUVs. It tracks down cases that originate from anonymous calls to a hotline, suspicions raised by company data scientists and on-the-ground crews or pings from a meter detector mounted on company cars. 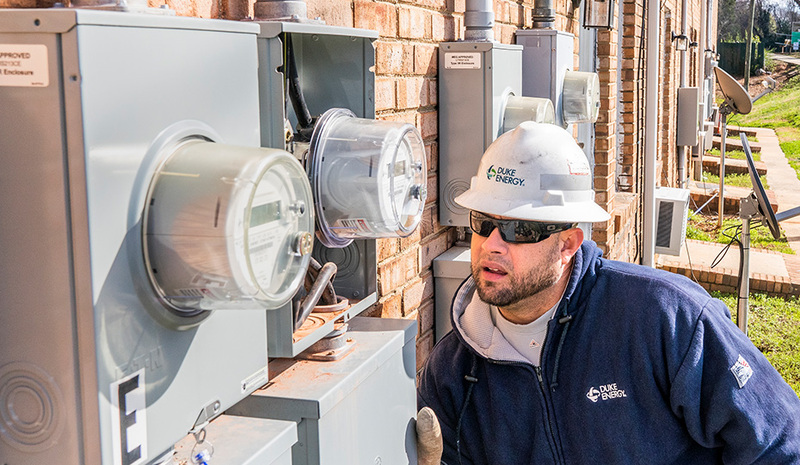 Once on-site, investigators look for some of the classic ways electricity thieves steal: rerouting the electricity to bypass the meter, swapping in a stolen meter or tampering with the meter. Danger is a constant. Jerry-rigged setups can cause burns, shocks or even death. Investigators always approach a meter with rubber gloves, fireproof clothing and face shields. All are trained on how to handle electricity safely. Sometimes there are dogs and angry people. Each investigator is trained in de-escalation techniques. Occasionally, a police officer assists. “We have a motto: No amount of theft is worth your life,” said Gary Sullivan, supervisor of Florida’s division. In his seven years on the team, Sullivan has seen some crazy situations: rigged-up systems that source marijuana operations; a suspect giving back a stolen meter after smashing it to bits, being threatened with a gun. Jose Roman examines the wiring to make sure there is no fraud taking place. Often, the work is emotionally draining as investigators meet people who are stealing because they are single parents or recently lost their job. The company is not interested in punishing people, but wants to reclaim revenue and correct unsafe situations. Two factors are leading to some major shifts in the division: First, the company’s move to smart meters is making it harder to steal electricity, but investigators know it’s just a matter of time before thieves figure out new strategies. Second, natural gas theft training is underway. Currently, a Piedmont Natural Gas team investigates natural gas theft cases and Duke Energy handles electricity. Soon, all investigators will know how to work both types. If you suspect energy theft or meter tampering, call your power company. Duke Energy in Kentucky and Ohio: 800.544.6900.